It takes a special someone with confidence and character to willingly undergo a (potentially) major transformation and face a camera right after that. For our Look Of A Hero campaign with We Need A Hero, we needed four of those special someones—each undergoing a makeover to showcase four upcoming hair trends for 2018. Our third campaign with We Need A Hero (WNAH) was, perhaps fittingly, a three-part affair. The first was identifying four suitable heroes, and getting them to visit the store in Tiong Bahru for an initial consultation. The WNAH team had in mind four hair trends for the year to come, and finding the four heroes to best showcase these trends was not quite as easy as it seemed. Quester, the senior training manager at Spa Esprit, and Janice, WNAH’s head barberess, assessed everything from the hair length and texture to the face shape of each potential candidate. When that was settled, the candidates returned to the store to get their hair cut. 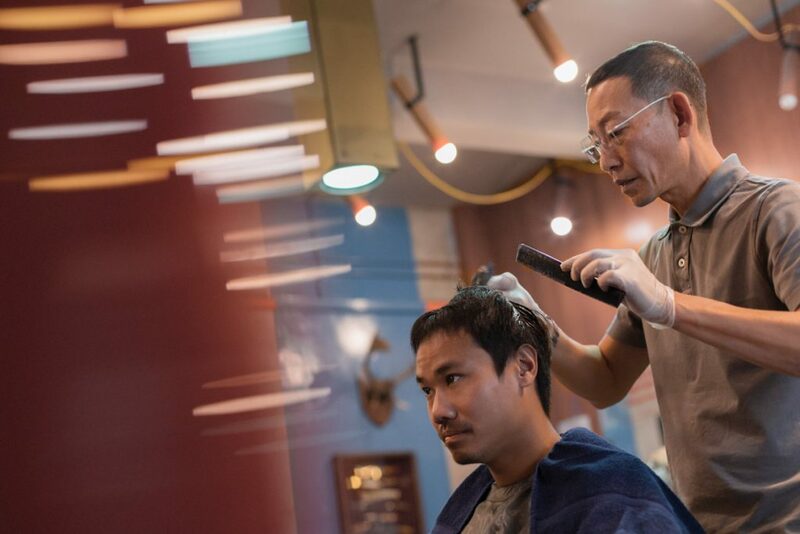 Some candidates had it easier than others—Jasper was happy that he was going to get a style along the lines of what he’d been looking for, while Jason just needed a dye and a trim, and didn’t seem too nonplussed. On the other hand, Thomas had to steel himself to lose a good 15 cm of hair, which he’d been growing out for over two years, and Loren spent close to three hours in the chair trying to get his straight locks permed to achieve the look the team had chosen for him. Nonetheless, in the good hands of the WNAH team, all four gents soon looked sharp and ready to go. Shoot day finally arrived. 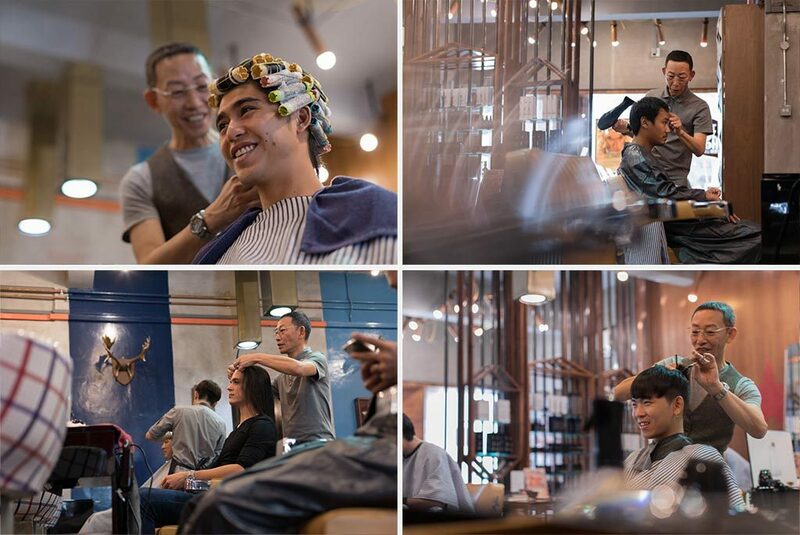 Each of our heroes came into our humble studio/office to get their hair styled, and with the help of our friends at Hugo BOSS, dressed in clothes from the HUGO collection to be launched next year. Thomas was first in, having to work a shift later in the day, and we could see how he’d grown to become more comfortable with his short chop. A checked red suit completed his dapper look, and he took to the set with all the ease of a seasoned model. Jasper arrived next, and had his fringe trimmed to give it the jagged edge that the trend required. In the same vein that Jasper experiments with his own photos, we went a little more extreme on set as well, and he gamely tried out plenty of different angles for his shots. Our third hero for the day was Loren, who was clearly nervous when he started off with so many pairs of eyes watching his every move on set. He got more comfortable over time, however, soon tuning out all distractions and taking directions like a professional. We ended off with Jason. Playful, yet incredibly relaxed in front of the camera, there was little that we needed to tell him to get him into the mood. Almost every pose came naturally to him, and we wrapped up our shoot day with some great vibes. It’s been a while since we shot entirely in a studio, and the campaign was as much a chance for the WNAH team to put their hairstyling skills on show as it was for us to explore and have fun. Of course, we couldn’t have done it without the help of our four sporting heroes, who gave both WNAH and the Shentonista team the opportunity to bring this campaign to life, showing us, once again, that there’s more than one look of a hero. This is a Shentonista project for We Need A Hero.